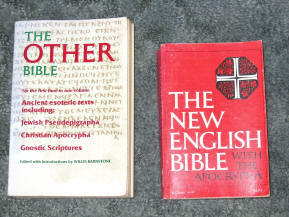 The lost book of the Bible that I had was The Didache or The Teaching of the Twelve Apostles. This book can be (loosely in some areas) (that may be biased though) described as the teachings of Christ rather than a narrative of his life. The whole book is basically all about the do’s and don’ts of Christianity, and seems to serve the purpose of handing out rules rather than giving purpose, history, or abstract doctrine. The book doesn’t have a lot of differences in Christ’s teachings in the Gospels or the Epistles of the New Testament, and it doesn’t have strong, blatant contradictions. However, it can easily be seen as an add-on due to it containing material that is not found in the rest of the New Testament. Summary of the text since the majority of your audience won’t have read it, and the similarities and differences. The Didache, in terms of set-up, can be more easily associated with Exodus, Leviticus, or the Sermon on the Mount than the four Gospels. The Didache is split up into four parts with the first being a description of two ‘Ways’: the way of life and the way of death. The majority of this part was like reading the ten commandments in the Old Testament because it was basically, “Do this,” and then, “Don’t do this.” (Chapters 1-6). The second part can be described as rules and regulations on how to perform rituals such as the Eucharist (communion) and baptism (Chapters 7-10). The third part deals with how to handle prophets, apostles, and travelling teachers of God (Chapters 11-15). The fourth part is a reminder of the fact that one day Jesus is coming back (Chapter 16). Before delving into specific parts and their comparison, I will mention that at several points there are direct quotes of Jesus, so it’s not like this book was just way different. The first part is really not all that different especially. The first sentence of the whole book is, “There are two Ways, one of Life and one of Death, and there is a great difference between the two Ways.” This idea is perfectly in line with the teachings of Jesus in the Gospels, and this is the theme of the first six chapters. The first four chapters are given wholly to the way of life (“Do this”), the fifth chapter is one long list about the way of death (“Don’t do this”), and the sixth chapter is a conclusion on the matter by basically saying, “don’t forget about this stuff.” All in all, these first six chapters are almost spot-on with the teachings of Christ, but with a few exceptions such as the command for a man to be thrown in prison if he takes a gift of money that he does not need. The similarities range from the two ways, to the need to be in unity with one another. An interesting add-on is that the very specific reference to abortion found in the second chapter. To my knowledge there is no specific reference to abortion in the Gospels or the Epistles, so its reference here is quite interesting. The second part is where some differences and add-ons come into play. Chapter seven is about baptism, and it has some add-ons with the command to recite something and to baptize in running water. This is not seen in any of the gospels or the Epistles; however, the running water may be in reference to a ceremony in Leviticus 14 involving two doves. Furthermore, the chapter makes exceptions with the running water command for places that are cold or in lack of water, and it commands for the baptizer and the one being baptized to fast beforehand. The exception of dunking is seen nowhere in the Epistles or the Gospels, the command to fast is an add-on, and the command for the one baptized to fast seems almost contradictory to the idea of not putting off baptism found in Acts. Another strange difference in the second part deals specifically with fasting. Apparently, hypocrites fast on Mondays and Thursdays… I didn’t know that. Furthermore, the command is fast on Wednesdays and Fridays. This is an add-on and not particularly contradictory, but it is somewhat strange. 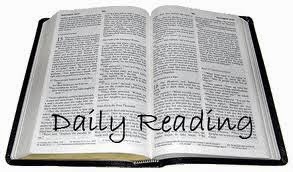 Chapter nine is about communion and it has an add-on of a commanded prayer while partaking of the communion. Chapter ten is another prayer that must specifically be used after eating. The third part is all about prophets, apostles, and those whose job it is to teach the Gospel. There are some intriguing differences pertaining to how one can know who is a false prophet in there that are not found in the Gospels or the Epistles. Some examples: if the prophet asks for money he is false and if he stays three days as a guest he is false. A lot of this section has to deal with how to handle the authority of these teachers, how to handle their payment, and how to handle hospitality towards them. Not much of what is seen in this section is found in the Gospels or the Epistles, although not much of it can be described as contradictory either. It’s all just add-ons, really. The last part is really similar to the Olivet Discourse and other verses like that found in the Epistles. The whole thing is about how Jesus is going to come back and how that everyone needs to be ready for that. To my knowledge there is no contradiction in what is said, and there isn’t really any add-ons either. The whole last part is in-line with the accepted New Testament. 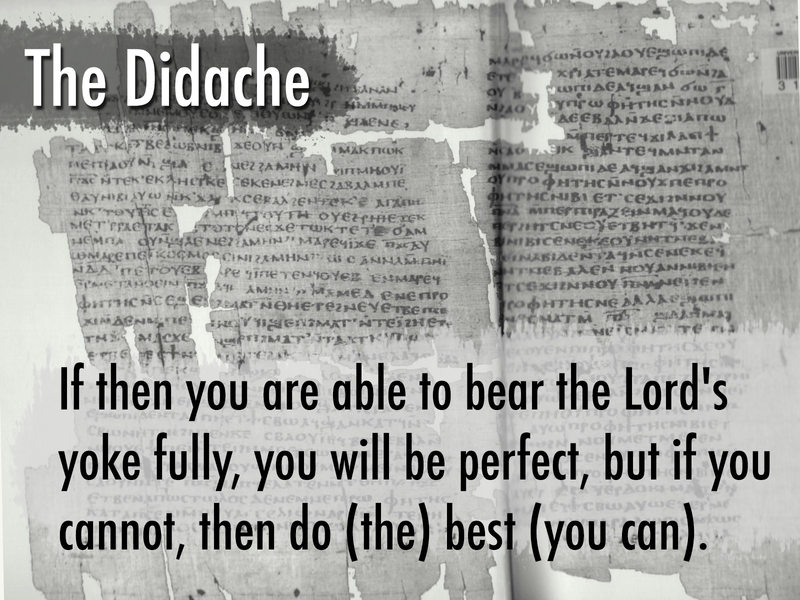 When researching The Didache most of the sources agreed on several topics concerning its origin. The topic of the author does not delve into specific people; however, there is much agreement on the use of the Q, and there is a lot of agreement that it is the recording of the Apostles first council found in Acts 15. This dating is rather impressive because of the fact that it is not in the New Testament today. One would expect that some of the earliest writings would be the accepted writings, but we find something different here. The Didache seems to be an odd case. The audience that The Didache is most often associated with seems to be two different groups; however, when looking at the first century they can be placed in the same group. After reading this text, I am going to have to agree with the audience here. I could easily associate this text with one of those teenage devotionals, just without all the fru-fru. The text as a whole seems to be a list of instructions, and it seems like something you could easily go through every day as a check-list to see what you did right and wrong. Therefore, it seems reasonable that the target audience may have been new Christians seeking a simplistic form of guidance in life. Something that can be considered without ever looking at any research is the contradictions found in this text when compared to the New Testament and the Gospels. Given the assumption that those books were merely the ones with a higher regard as inspired, one would look at this text and decide that it can’t be right merely for the few blatant contradictions. However, take away that assumption and you can be left pondering the question some more. The reasons that I found in my research were not very thorough or convincing of their lack of being in the New Testament, but this may just be because of the bias of the writers. I’m not really all that convinced that it doesn’t belong due to its lack of literary value, and I’m not too convinced that it doesn’t belong due to its primitive nature. However, I can be convinced that it was taken out almost naturally due to some of its contradictory nature. I’ve been reading The Case for Christ by Lee Strobel for quite some time now, and one of the scholars that he interviews gives some interesting insight as to how the books of the Bible of the chosen. The interviewed, Bruce Metzger, said that there was three criteria to accepting something as inspired in the early Church: apostolic authority, conformity (did it agree with basic doctrine), and third continuous usage and acceptance by the church. What Metzger concludes is that the books not included are simply not included due their lack of agreement with books that are accepted and used most frequently. It’s almost like an ugly duckling analogy. Due to a text’s contradictory nature to what was widely accepted as the Bible and trustworthy, the text was naturally weeded out. I really like one thing said in particular, “…the canon is a list of authoritative books more than it is an authoritative list of books. These documents didn’t derive their authority from being selected; each one was authoritative before anyone gathered them together.” Therefore, the fact that this text isn’t included in the canon may likely originate from the small contradictions found, the lack of harmony many of the parts have with the Gospels and the Epistles, and the overall lack of authority that the early church deemed it to lack. The Didache is certainly an easy read, and in terms of content really isn’t all that different than what you find in the Gospels and Epistles. Moreover, the text has some solid content that any new Christian could really use, and it has a great form to its first five chapters that any Christian could potentially use as a check-list of do’s and don’ts. However, the small differences, the lack of harmony in certain places of this text compared to widely accepted texts, and the add-ons does give cause to doubt in terms of its potential to be in New Testament. Posted on February 23, 2015 February 23, 2015 by dgaskins08	This entry was posted in Uncategorized. Bookmark the permalink.